HomeE-BulletinOthersThe Kra Canal Book – The end of Books? All RCB Members are cordially invited to attend the official launching of the book, which is going to happen on December 23, 2018, at the Intercontinental Hotel Rajaprasong Intersection. After multiple discussions with RCB Club Members, in and outside the club, the impression has raised, that our society has reached the end of books. Opinions have been expressed, that various tablets can replace books, requiring less space on the overloaded book shelves. Buying and having books is not any more attractive in times of digital information. Reluctancy in regard to purchasing books became evident. This was especially experienced where books have been offered to club members at special discounted rates during RCB club meetings. That money has been an issue has strongly been denied. Using the example of the KRA CANAL BOOK the mind set behind is best demonstrated when counting the number of books sold after two RCB club meetings. Some members argued, that the content of the Kra Canal book is the same as has been presented during the last seminar in September 2017. The fact is, that this only shows lack of actual information as the book content and the September 2017 seminar content are only looking to be the same but are in fact very different. Beyond one club member who bought 20 books for his customers, 2 more books have been sold by the club secretary. 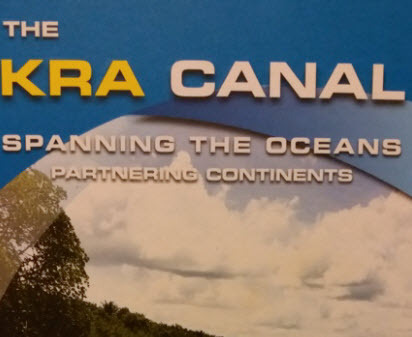 As the Thai Government is speeding up information on the Kra Canal Project in the public, it is evident, that the majority of the club members do not even recognize, that there is a book authored by General Saiyud and Dr.Harald Wagner providing comprehensive information and predicting the biggest economic change in the history of Thailand. Can any RCB member in the context of Thailands future dare to keep uninformed by relying on tablets ? I don’t think so ! The END OF BOOKS has not yet arrived ! The Kra Canal has a special spirit keeping the dormant project vibrant over about 350 years. In the foreground it has the power to unite the South of Thailand with the rest of the country, as infrastructure promotes peace because it supports understandings between people promoting democracy and showing the road to a prosperous future for Thailand. Please Contact K. Fern to book your copy.